This entry was posted in Fashion, Video Games and tagged Bayonetta 2. Bookmark the permalink. This is reblogged from the good folks over at the very entertaining and thoughtful Final Fashionista. I have so many feelings and reactions to this, that I just don’t know where to begin. Above all else, I have to agree with Conan O’brien and take it further by saying not one thing about this promotional image makes sense. She has both her weapons drawn and no fixed target. She has guns attached to her heels, a place no man or woman would ever keep them. She is in (what I assume) is a spandex and leather catsuit with an open back and multiple openings going down her legs, presumably so she can get some air, which she wouldn’t need if her outfit was better designed or used better materials for the construction. And what is going on with the hair that appears to be her billowy sleeves? The flowing sleeves or fringe or whatever does not even go with the rest of her tight fitting outfit. None of that makes sense individually, let alone together. Even the implied action ready fan service-y pose doesn’t make any sense because all that hair would undoubtedly get tangled around her and make it impossible for her to move normally. Never mind, she seems to be aiming at whatever is behind her without bothering to turn around. The pose itself is very stiff despite her face trying to assure the potential buyer she’s having a blast. I would think the weapon she has attached to her heels are for an emergency. If she ever needs them, how would she reach them quickly? Not to throw the character designer under the bus, but this is not a well thought out design in the least. It is rule of cool at its worst. 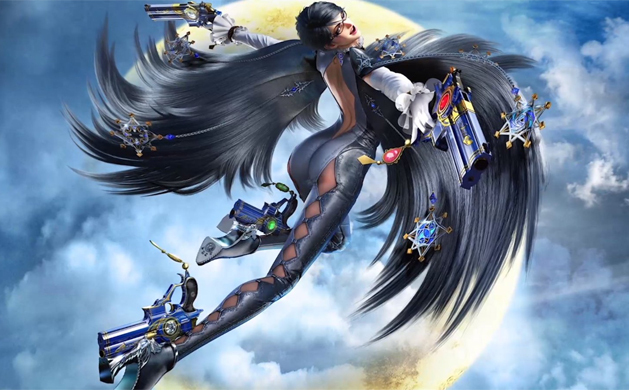 To be fair, the cover for Bayonetta 2 isn’t anything new, there are far worse examples in comic books, movies, and animation. It is a failure of common sense and imagination plain and simple. The worst part is the image is meant to be cool and desirable to people. It is supposed to grab a passerby’s attention and at a minimum make them think, “That’s cool! I might want this [game].” I can’t ever imagine passing this image and wanting what it is trying to sell besides the glasses.